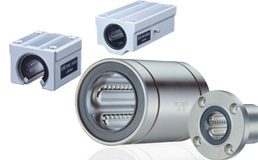 Slide Bush | Products Lineup | Products | NIPPON BEARING CO., LTD. The NB SLIDE BUSH is a linear motion mechanism utilizing the rotational motion of ball elements. Since linear motion is obtained using a simple mechanism, the slide bush can be used in a wide variety of applications, including transportation equipment, food processing equipment, and semiconductor manufacturing equipment. The outer cylinder of slide bush contains a ball retainer that is perfectly designed to control the circulation of ball elements, resulting in smooth linear motion. The NB SLIDE BUSH uses a round shaft for the guiding axis, resulting in space-saving, which allows for compact designs. The NB SLIDE BUSH is available in various types, standard, clearance-adjustable, open, flange, etc., for a various applications. The GM SLIDE BUSH makes efficient use of resin subparts making it possible to achieve an overall weight reduction of 30～50% compared with the SM SLIDE BUSH. The ball return section is made of resin material, which serves for low noise operation. Also, cost-effectiveness expands the use of slide bush in many applications. NB SLIDE BUSH is available in standard and anticorrosion types. Available options include steel retainer suitable for use in harsh environments and resin retainer for low acoustic, low-cost requirement. Other options can be specified according to the application requirements. Block type series is a unit of NB SLIDE BUSH and a block type housing. A variety of block types are available such as precision-machined blocks, resin-made blocks, and cost-effective units, each contributes to higher accuracy, light-weight, and low-cost and design-time saving, respectively. The NB SLIDE BUSH is fully compatible with a variety of shaft types. FIT series is a combination of NB SLIDE BUSH and precision-machined shaft. The best-fit between SLIDE BUSH and shaft achieves a smooth, high accuracy performance meeting the customer requirements.